There is little the government will be able to do this time around: schemes like Help-to-Buy , which helps people become home-owners, will have to give in to the reality of a 5% budget deficit and the need for lower spending. Higher taxes may be on the way too. While the last budget from Number 10 ignored Brexit, some local councils are already feeling the pinch and threatening to raise taxes. 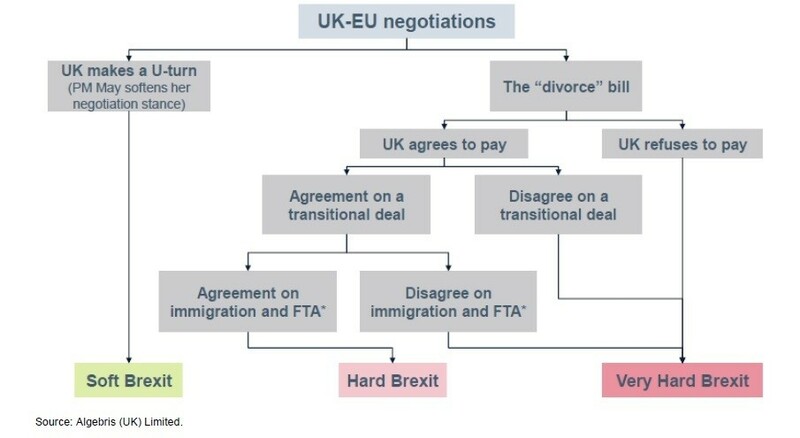 As we illustrate below, the equilibrium scenario based on both sides’ incentive structures will be the EU offering a bad deal which the UK will accept . 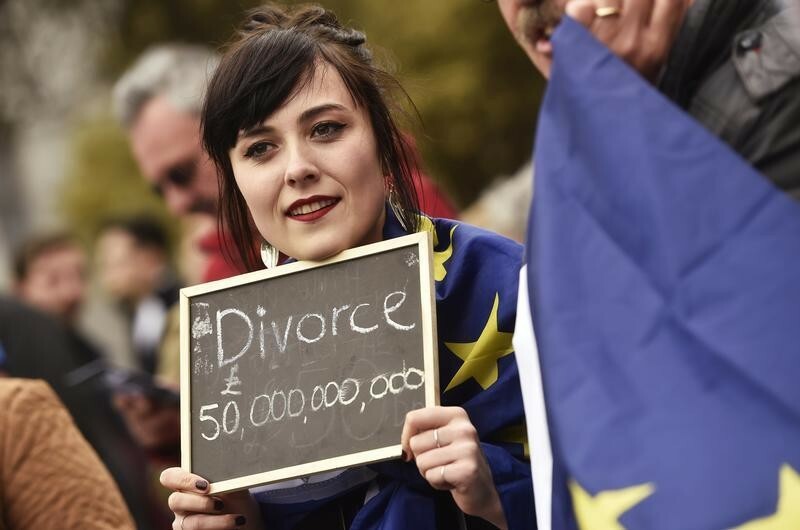 The “divorce bill” : European Commission President Jean-Claude Juncker and the EU’s chief negotiator for Brexit Michel Barnier have said that the UK has to pay an exit bill of around €60 billion, and the bill would need to be agreed before beginning negotiations on an FTA or transitional agreement. The UK’s Brexit secretary David Davis so far ruled out paying for a hefty bill, as it would be politically challenging given that Brexiteers campaigned on a promise of “saving £350 million a week from Brussels”. Ultimately, we think the UK and EU will agree to a bill, but that this will only be paid after a trade deal is finalized. This would allow negotiations to continue, while not appearing as a defeat for May. In our view, the complexity behind the Brexit bill calculation means there is room for the UK to negotiate when it comes to the EU’s current estimate of €60 billion. The exit bill itself mainly comes from the UK’s budget commitments for 2019-2023, which it still needs to pay post-Brexit, unfunded pension liabilities for UK staff who worked in the EU’s institutions, and other contingent liabilities. According to estimates by the Centre for European Reform , the bill could range between €24.5 billion and €73 billion, depending on the calculation methods and what will be covered. Free trade agreement : May aims to achieve a “bold and ambitious free trade agreement” with the EU and start negotiations early, as expressed in her letter to President of the European Council Donald Tusk. May has downplayed the challenge of achieving an agreement by stressing that sectors like the auto industry and financial services may adopt existing single market agreements. However the reality will likely be an extended period of uncertainty, as both sides may agree the broad terms of a trade deal before 2019, but leave the details and ratification for a later date. Additionally, as part of the broad terms agreed to, the EU and UK will need to agree on an institution to settle FTA disputes so as to give the EU assurances that following a trade agreement, the UK will not undermine the single market through regulatory dumping . Immigration : The Brexit campaign focused on the cost of net migration and promised voters fewer migrants if Britain left the EU. May will now need to deliver on this promise, as she highlighted in her January speech . While May has effectively ruled out the possibility of implementing a point-based migration system for EU nationals, the final deal may include a limit on net migration from the EU under a work permit scheme . Transitional agreement : UK-EU trade will need to be governed by a transitional agreement, between the date that the broad terms of an FTA is agreed and when the FTA comes into effect. Rather than negotiating separate terms for this transitional agreement, we think during this period UK-EU trade will remain governed under EU law and the European Court of Justice. A weaker sterling, with higher inflation : We think the pound sterling will likely weaken further as the illusion of a good deal fades. The Bank of England is unlikely to offer much help, both because it does not have the foreign-reserve fire power to defend its currency, and as the Bank will likely maintain an accommodative monetary stance to support growth in the face of rising inflation. A potential loss of reserve currency status would further hurt sterling, which currently makes up 4.5% of global FX reserves. With the UK importing nearly 46% of its energy and 50% of its food, a weaker sterling will lead to higher import-led inflation. A growing public deficit : Chancellor of the Exchequer Philip Hammond’s spring budget effectively ignored the consequences of Brexit, predicting a decline both in borrowing and debt-to-GDP by 2021. The budget is predicated on unrealistic expectations of declining unemployment, falling inflation and steady growth. The reality is that the government may need to increase fiscal spending to support the economy, leading to a further widening of the fiscal deficit, currently at -3.8% of GDP. Lower consumer spending will hurt retailers : The Office for Budget Responsibility forecasts that UK household debt-to-disposable-income will rise from 143% in 2016 to 153% in 2022. This will likely result in households having lower disposable income, at a time of higher inflation. UK retailers are likely to be squeezed by lower revenues and higher costs due to import-led inflation. Negative real returns for savers : With the Bank of England likely to maintain low rates despite rising inflation, Britons will suffer from negative real returns on their savings, which are already precariously low. According to a study by Money Advise Service, over 16 million Britons have less than £100 in savings. The property market is unlikely to provide sufficient protection, with markets already showing cooling signs given lower demand from foreign investors.